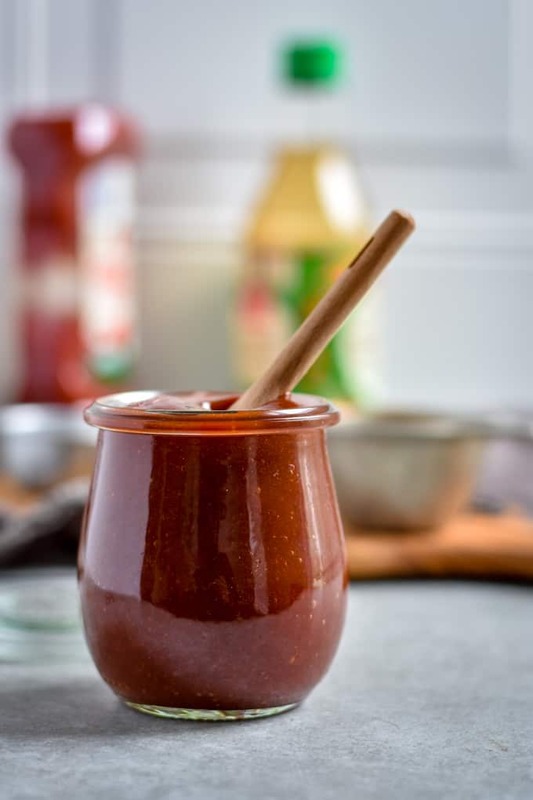 This Easy Homemade BBQ Sauce is delicious as it is simple. Sweet, tangy, vegan, and ready in 5 minutes. And, it’s made with super simple ingredients you probably have right now. BBQ Sauce should NEVER be bought! Why? Because it’s usually nothing more than a bottle of overpriced red high-fructose corn syrup. That is, unless you’re willing to spend 8-10 bucks on one of the so-called “higher quality” brands. Nope! This is one of the the easiest, simplest, and most cost-efficient sauces to make at home. It’s also very manly. 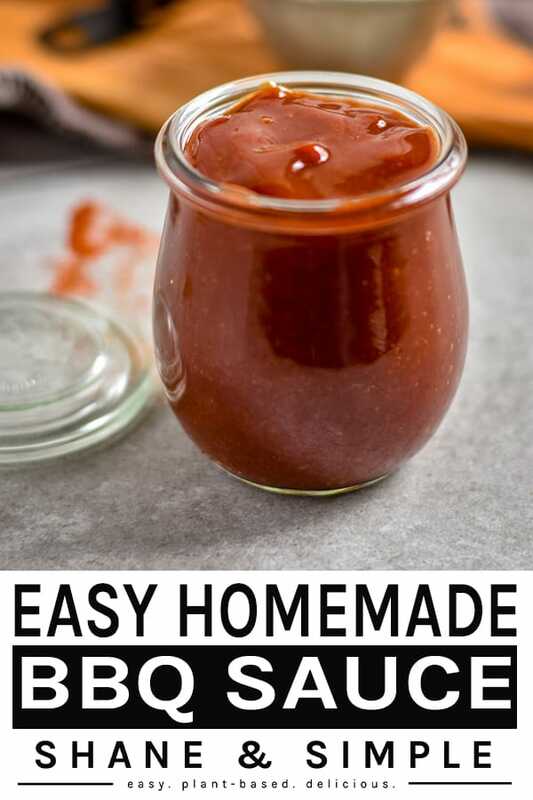 So, save your money and strengthen your manhood by making this Easy Homemade BBQ Sauce. 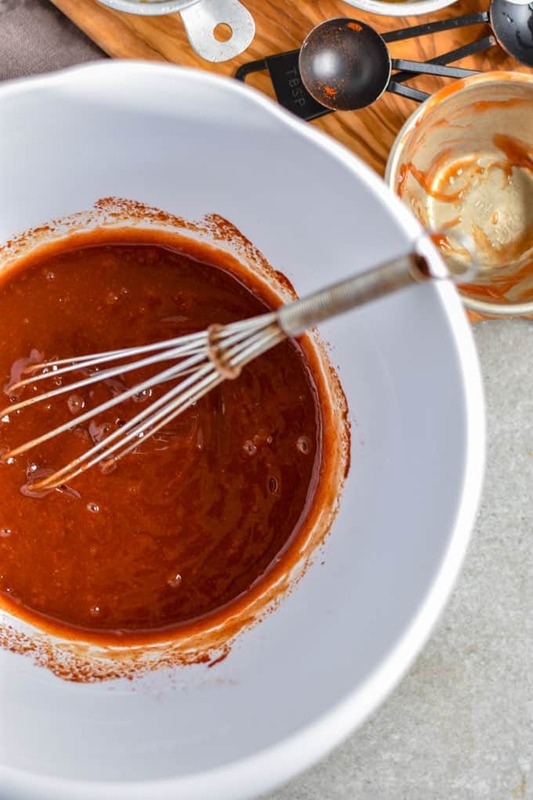 You’re probably thinking there’s some big secret to making a decent homemade barbecue sauce. Nope. It can actually be made with very simple ingredients probably sitting in your fridge right now. I’m sure I’ll catch hell from all the BBQ “purists” out there. But, I really don’t give a crap. My goal is to make healthy tasty, easy and accessible for you. I really couldn’t care less what the “professionals” think. Now, back to the ingredients. Let’s take a look. Shall we? Organic Ketchup: Why organic ketchup? Because it doesn’t have corn syrup in the ingredients. You could also use Simply Heinz as well. Just be sure and read the label. Maple Syrup: It’s completely optional. So, if you like a more robust bbq sauce just leave it out. I tend to like mine a little sweeter. Vegetarian Worcestershire Sauce: Be sure it’s vegetarian. Many brands of Worcestershire sauce use anchovy. A damn fish! In BBQ sauce! So, once again…make sure it’s vegetarian. 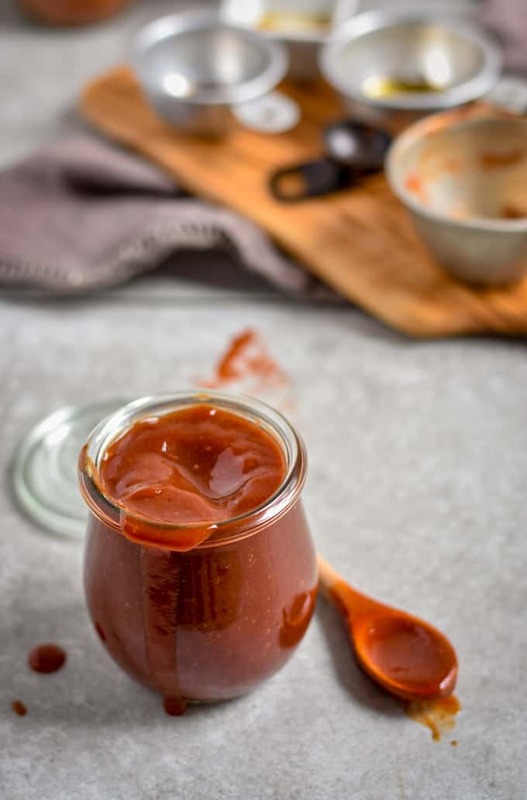 Low-sodium Soy Sauce or Tamari: If you want to make this Easy Homemade BBQ Sauce gluten free, use Tamari. White Vinegar: It’s completely optional, but I like the “bite” the vinegar adds. Smoked Paprika: Feel free to use regular paprika. It’s completely up to you. But, I LOVE smoky things. Liquid Smoke: Once again, this is optional. Like I said, I love smoky things. Yellow Mustard: Nothing fancy. Just plain, everyday yellow mustard. Put all your ingredients into a bowl and whisk. Done! 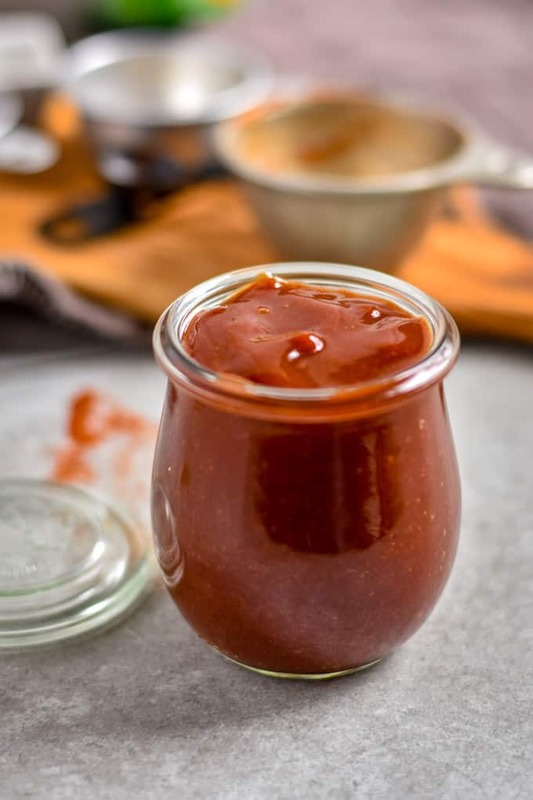 Give this Easy Homemade BBQ Sauce a try. 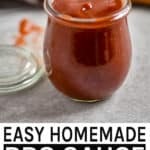 I’m sure you’ll like it because it’s..
Use this Easy Homemade BBQ Sauce for beans, jackfruit, soy curls, tofu or on top of baked potatoes. It also makes a delicious dipping sauce. Simply heat in a small sauce pan over medium-low heat after whisking. Perfect! Looking for more dip and sauce recipes? Try my Oil-Free 8-Minute Marinara Sauce, Game Day Cheese Dip, or Five-Minute Peanut Dipping Sauce. I’m sure you’ll find a use for all of them. You know the drill. Like always. If you make this recipe, be sure and let me know! Leave a comment, RATE IT, and tag a photo #shaneandsimple on Instagram. 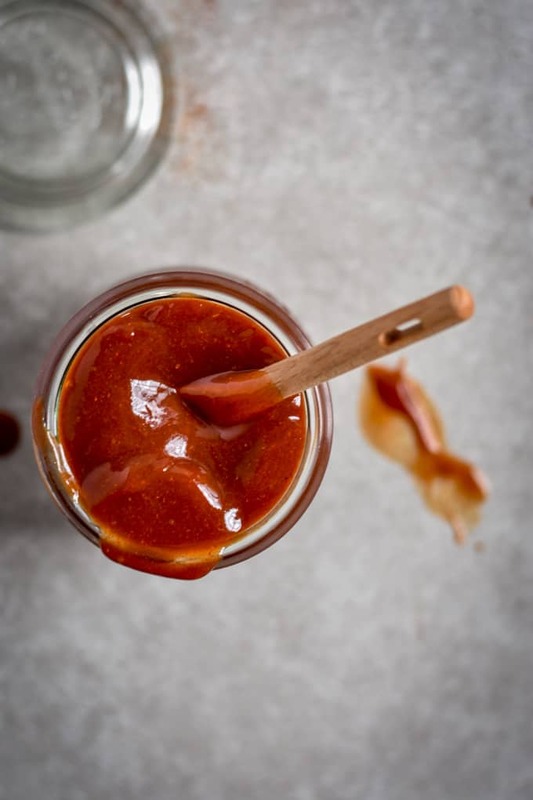 Sweet, tangy, and super delicious homemade vegan barbecue sauce. Super easy to make and ready in less than 5 minutes. Whisk all ingredients together in a small or medium sized bowl. Store in glass jar with screw on top. Will keep in the fridge for about a week. I made this BBQ sauce yesterday& we dipped our breaded tofu strips in it. It was delicious. The best I’ve tried yet & the easiest. It’s a keeper for sure. 😊Thank you. What could I substitute for the Worcestershire sauce? I have been unable to locate any vegan versions locally. Thanks! 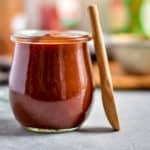 Todd, try this: 2 teaspoons soy sauce, 1/4 teaspoon lemon juice, 1/4 teaspoon maple syrup and a dash of hot sauce for every tablespoon Worcestershire.